Take this 5-hour tour of the UNESCO-listed El Escorial Monastery and the Valley of the Fallen from Madrid. Delve into the fascinating history of the El Escorial Monastery, one of the King of Spain's official residences, with your expert guide. Gaze at the mesmerizing Valley of the Fallen, a colossal monument that memorializes those killed in the Spanish Civil War. The Royal Site of San Lorenzo de El Escorial, commonly known as El Escorial, is a historical residence of the King of Spain about 28 miles (45 kilometers) northwest of the capital, Madrid. It's one of the Spanish royal sites and functions as a monastery, royal palace, museum, and school. The Escorial comprises two architectural complexes of great historical and cultural significance: the royal monastery itself and a royal hunting lodge and monastic retreat. El Escorial was, at once, a monastery and a Spanish royal palace. Originally a property of the Hieronymite monks, it is now a monastery of the Order of Saint Augustine. In 1984 UNESCO declared The Royal Seat of San Lorenzo of El Escorial a World Heritage Site. It is a popular tourist attraction, often visited by day-trippers from Madrid. The visit include the Monastery, the Cloister of the Four Evangelists, the Palace of Philip II, Pantheons of the Royal Family, the Chapterhouses, and the Basilica. 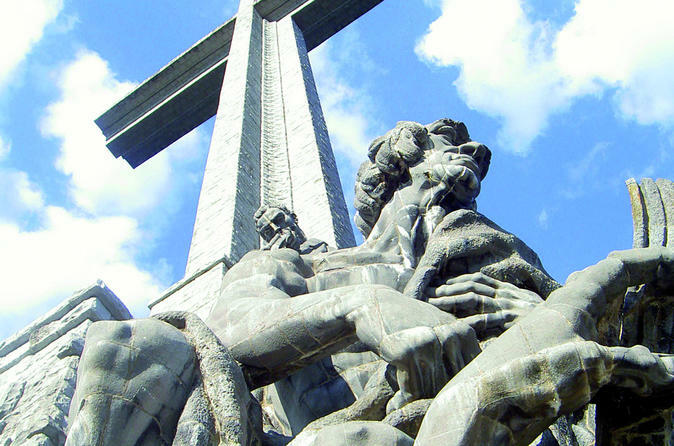 The Valley of the Fallen is a Catholic basilica and a monumental memorial in the municipality of San Lorenzo de El Escorial, near Madrid, conceived by Spanish General Francisco Franco to honor and bury those who fell during the Spanish Civil War. It was claimed by Franco that the monument was meant to be a "national act of atonement" and reconciliation. Located in a beautiful valley in the Mountains of Guadarrama, this impressive work has a colossal cross over 150 meters (492 feet) high, and the Basilica and Crypt excavated in the hard rock under the mountain. This tour includes the entrance to the valley and the visit inside the basilica. After this visit you will return to Madrid.